More than half the battle of starting a successful online store involves finding the right products to sell online. And as a result, I receive between 4-5 emails per day from readers asking me for niche ideas. I am sooo ready to start my own online business but I have no idea what to sell. Can you just give me 2 or 3 good niches and I’ll do all the work from there. Steve, I enjoyed reading your 6 step program and I was wondering if you have some good ideas that you would like to pursue but don’t have the time. The funny thing about finding the right niche is that it’s really difficult to just sit down, brainstorm mindlessly and hope to find the right product to sell. Sure, you might get lucky and come up with a great product idea this way. But if you’re anything like me, creative ideas don’t fall from the sky very often if ever at all. In fact when I try to think of niches on my own, I often end up wasting my time on common place goods that are way too saturated or brilliant ideas that have zero demand. Here’s the thing. You can’t take a completely random approach to the niche finding process or else you’ll end up brainstorming FOREVER. 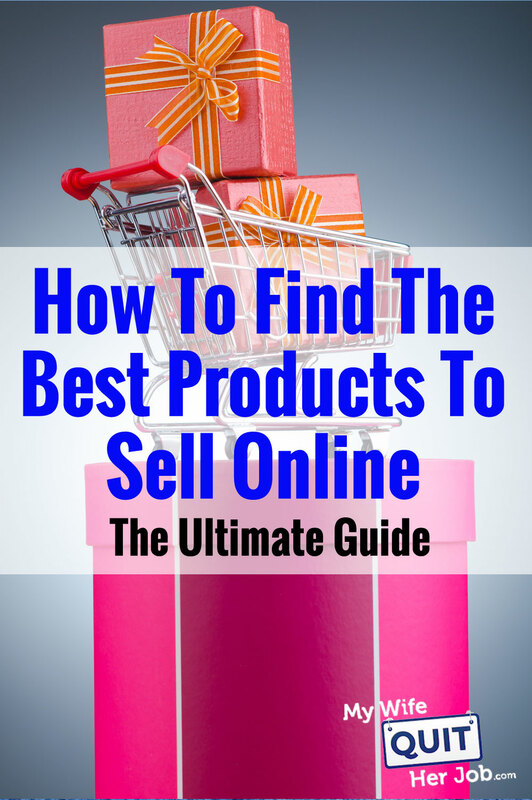 So today, I’m going to teach you a methodical approach to finding the best, most profitable products to sell online. These are real methods that I use every single day that are based on real life sales data and a specialized set of tools to help me out. As I show you my process, the important thing to realize is that you can’t let your experiences or personal preferences bias your thinking otherwise you’ll get stuck on a dead end business idea. In my experience, the best way to break out of a creative funk is by relying on computers and data because they are 100% impartial. Editor’s Note: The material in this post is just a small fraction of what I teach in my FREE 6 day mini course. If you are interested in starting your own ecommerce business, then sign up below! Also if you’re curious about what I sell online, you can click here to check out my little online shop. Do You Want To Carry Inventory Or Dropship? How Do I Find My Vendors? When it comes to selling physical goods online, I always like to start with a certain set of guidelines during the product selection process. Because selling online is completely different than selling in a brick and mortar store, you want to choose products to sell that are conducive to online purchases and appeal to the typical online buyer. Here are some of my “must have” product guidelines when choosing what to sell. The product should not be fragile and easy to ship – Because we are going to be shipping products through the mail, you can avoid most headaches if you choose a product to sell that won’t break during shipment. The product should not take up much physical space – Certain ecommerce business models require carrying inventory so it’s in your best interests to choose something small to sell and preferably an item that fits in a shoebox. The product’s inherent value should be ambiguous – For example, I would never sell electronics because there is a set value for your goods that everyone is aware of. On the contrary, keepsakes and informational goods are much harder to place a price tag on. Avoid seasonal goods – In general, you don’t want to choose products that are only purchased during a specific time of year. For example, I would tend to avoid selling Halloween costumes. Sell goods that sell from $15-200 – This is the sweet spot for pricing for online purchases. Have you chosen a niche with related products you can expand into? – While we primarily sell handkerchiefs in our store, we’ve branded our shop as a linens store so we can easily expand to other markets. Do your products lend itself to customers ordering more than one? – When we sell handkerchiefs to a bride, we rarely sell 1. Instead a typical bride will buy at least 4 and sometimes as many as 10. Can your products be personalized? – The margins for personalized products are always going to be higher than regular products. So if you can offer customized goods, you can charge more for them. Are your products consumable? – What’s nice about consumables is that your repeat customer rate will be high. As a result, your sales will tend to be more stable. Does your niche have a fan base? – I like to choose products that have dedicated blogs or fan pages because you have an instant set of customers to market to. Do your products lend itself to content creation? – When you own your own shop, search engine optimization will be an excellent source of traffic to your store. As a result, the more content you can put out, the more likely you will rank. Do your products have lots of accessories? – Many online stores make most of their margins on the accessories they sell. So it’s in your best interests to offer goods that are conducive to upsells and cross sells. Because there are so many different types of products that you can sell online, you also need to think about what purpose your product serves. Is Your Product Like A Candy? A “candy-like” product is a product that doesn’t really solve any problems or offer any inherent benefits but it’s a nice-to-have. People enjoy buying them because they bring immediate pleasure and they can be super profitable if they become trendy or become a fad. For example, fidget spinners were a popular “candy” and they sold hundreds of millions of units worldwide in a short period of time but sales eventually fell off a cliff. The problem with candy products is that when they go out of style, sales plummet. You want to ride the wave while it lasts but you can’t expect long term gains. Is Your Product Like A Vitamin? A “vitamin-like” product is a product that has long term positives and solves an emotional need but it’s very difficult to quantify the benefits. For example, I take Airborne when I’m sick but I have absolutely no idea whether it actually does anything. But it does make me believe that I’m fighting my illness so I continue to buy it. The most successful “vitamin-like” products become a habit (like Airborne) and create a psychological need. Is Your Product A Painkiller? Painkillers solve an immediate need and are the best types of products to sell online. One of the students in my Create A Profitable Online Store Course, Abby, makes millions every year selling special insoles for women’s high heeled shoes. Now I’m a guy so I have no idea what it’s like to wear high heels but apparently it’s extremely uncomfortable to wear them all day because her products sell like hotcakes. Women all over the world have foot pain and her insoles solve an immediate need. Here’s a podcast where I interviewed Abby. I also have a friend, Kevin, who sells a laser hair growth product for men and he makes tens of millions of dollars every year. Now this product I can relate to. If I was losing my hair, I would spend gobs and gobs of money on products to get it back. Bottom line, the holy grail of ecommerce is to sell a product that solves an immediate problem. But most likely, you’ll find a product that lies somewhere in between a vitamin and a painkiller and that’s perfectly fine! You can make money no matter what type of product you choose if you execute properly! In any case, once you’ve reviewed these guidelines, it’s time to start the brainstorming process! Below are the tools and platforms I use to find profitable products to sell that meet these criteria. Amazon is slowly becoming the defacto standard for online shopping in the United States with the greatest ecommerce marketshare of any individual company. As a result, sales data derived from Amazon is a great representation of overall demand. In fact, more and more people are going straight to Amazon for ALL of their online shopping needs while bypassing Google and smaller online boutiques altogether. Now at first glance, it’s not obvious that you can derive actual sales numbers from Amazon but I’ll show you how below. Did you know that every item sold on Amazon is assigned a BSR or best sellers rank? This number is used by Amazon to rank how well a product is selling compared to others within the same category. Here’s an example of a BSR rating for silicon baking mats on Amazon. So what does the BSR tell you about a particular product? Based on the BSR, you can make an educated guess on how many units are sold per day. 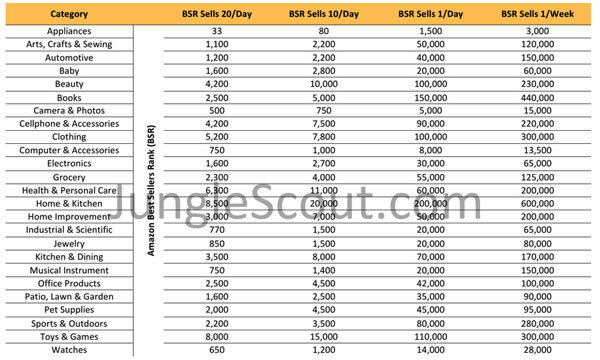 Here’s a BSR to sales chart provided by my buddy Greg Mercer if you want to do your own Amazon sales analysis. Using the silicone baking mat example above, a BSR of 7228 corresponds to about 10 sales per day. In a nutshell, you can browse Amazon for product ideas and know roughly how well a product is selling by looking at the BSR. And through some persistence and hard work, you can probably find a profitable niche to pursue. Now using the method above to gauge demand works fine but it’s extremely tedious which is why I like to use a tool called Jungle Scout to help with the research. Jungle Scout greatly speeds up the process by nicely collating all of the products on Amazon into a nice table for consumption. In addition, it can also point out specific products on Amazon that match your criteria. For example, I can have Jungle Scout return me all products under the Kitchen & Dining category that make at least $5000/month with less than 100 reviews. This is extremely powerful! Below is a 5 minute video demo on how I use Jungle Scout to do product research. If you want to follow along with the video step by step, then download a free trial of the tool. As you scan through all of the products on Amazon using Jungle Scout, here are some “Amazon specific” product criteria to keep in mind. Does The Overall Market Have Sufficient Demand? Even if you can find a single product on Amazon that sells reasonably well, it’s important to gauge the size of the overall market for demand. And the best way to verify demand is to look at the monthly sales estimates for similar products on the front page of Amazon for your product keywords. Personally, I like to see at least 1500 sales per month across all of the sellers on the front page after eliminating the unrelated products. Is The Product Too Competitive? On Amazon, the overall strength of a product listing can be approximated by the number of reviews it has amassed. In general, I like to see the average review count for the listings on the front page of Amazon for your product keywords to be under 100 reviews. Years ago, you could throw up any product on Amazon and it would sell. But today, you need to think about how you can add value to the existing market by making a better mouse trap. As a result, I always take a deeper dive into the competition to see if I can sell a product that has superior benefits to what is already out there. For example let’s say that I wanted to sell yoga mats online. Because yoga mats is a competitive market, I might want to differentiate my product by offering a special 6 inch thick mat that no one else is selling. Is There An Even Distribution Of Sales Among Sellers? As I’m looking at the competitors on Amazon using Jungle Scout, what I don’t want to see are 1 or 2 sellers completely dominating the market. A dominant seller usually means that the product has a strong brand that is driving sales which makes it much more difficult for you to break into the market. Are Your Margins High Enough? Ultimately the goal of selling products online is to make a profit. So you need to look at the average selling price and make sure that you can source the product at a sufficient margin. In general, I shy away from any product that does not sell for at least $20. And the cheapest place to source products online is generally from Asia. Is Your Product Niche Enough? The best products to sell online can not be readily purchased at a brick and mortar store. As a result, try to pick a product that is more obscure and not mainstream. For example, my online store sells handkerchiefs online which generally can’t be found in most stores. Similar to Amazon, EBay is also a great place to look for potential products to sell in your online store. Even though Amazon is a much larger marketplace, EBay is a great place to do research because you have access to sales data in real time. A lot of sellers on EBay bulk import goods from Asia at a very low price and simply list them on EBay for a profit. However, because Ebay’s selling fees are quite high, it’s hard to make a good profit on auctions. So if you can find high demand goods on EBay and create your own online store around these items, you can potentially make a lot of sales and not have to pay EBay’s high final value fees. In fact, my wife and I started out on EBay by listing our goods with auctions in order to gauge demand before we launched our full blown online store! To brainstorm products to sell on EBay, simply type in a product on EBay’s search bar. Then look for the “Sold Listings” link in the sidebar and click on the check box. Voila! EBay will now display a listing of products that have sold in the product category of your choice along with the final selling price. With this information, you should be able to get a good idea of the demand and selling price of a wide variety of products. Now using the method above to gauge demand works fine but it’s extremely tedious which is why I like to use a tool called Terapeak to help with the research. Terapeak is a tool that scrapes all of the EBay listings and collates the data for you in an organized fashion. For example with a few clicks of the mouse, Terapeak can tell me the hottest selling products on EBay and exactly how much revenue it generated last month. More importantly, Terapeak also tells me exactly what percentage of auctions for a specific item resulted in a sale which provides crucial data on the demand for a product. Here’s a quick demo of how I use Terapeak to brainstorm products to sell online. Sign up for the free 7 day trial below if you want to follow along with the tutorial. Update: After the merger with EBay, Terapeak recently removed all of their category research features. However, you can still get sales and sell through data for individual products. While some people like to shop on Amazon or EBay, others go straight to the search engines to do all of their online shopping. And since Google is the largest search engine in the world, it makes sense to look at what people are searching for to find good products to sell online. The easiest way to obtain search data is by using the Google Keyword Planner which is a free tool from Google. By looking at the exact keywords that people are typing in, you can get a good idea of what products are in demand and how much revenue you can generate. However, interpreting the search results can be a little tricky. For one thing, you need to only look at keywords that are product focused. For example, the keyword “outdoor gardening tips” would not be a good keyword to focus on because people are likely looking for information. A much better keyword to target would be something more specific like “plastic compost bin”. The other thing you must consider is the competition for that keyword and how hard it is to rank for in search which is information that is NOT provided by Google’s Keyword Planner. To analyze product demand and competition in search, I like to use a tool called Long Tail Pro. Like the other tools I’ve mentioned in this post, Long Tail Pro is a tool that nicely collates the Google search results and tells you how much competition a keyword has in search. Below is a quick 5 minute demo of how I use Long Tail Pro to find keywords with high volume that are easy to rank for in search. Overall, I like to see the number of searches per month for a keyword of at least 1500-3000 with a keyword competitiveness of 35 or less. The key thing to realize when finding products to sell using Google search data is that not everyone who performs a search is looking to buy. In fact, most of the searches conducted on Google are for information. As a result when I do keyword research, I also perform these additional checks. First off, I make sure that most of the listings that come up for a given keyword are for commercial use. If I see a bunch of blogs and informational sites on the front page, then that’s generally a bad sign. I also take a deep dive into the other websites on the front page to see if I can build a better looking and more usable website. Remember, the success of your business not only depends on whether you can get traffic but whether you can stand out among the competition as well. The shopping cart comparison engines are often overlooked when it comes to brainstorming product ideas. But used correctly, these websites carry a potential goldmine of valuable data. Because millions of people use these shopping engines to find products every single day, you can use their statistics to help you narrow down your niche. Some of the more popular shopping comparison engines include Nextag, Google Shopping, Shopzilla, Shopping.com etc… For the purposes of demonstration, I’m going to show you how you can use the popular comparison shopping engine Shopzilla, to further your niche research. On the Shopzilla.com website, there are 2 main places to begin your research. First off, you can find out which products are trendy by clicking on the “Trending Now” link. Here, the Shopzilla shopping engine will show you all of the popular items that are currently selling now! In addition to trending items, you can also find out which product categories and items are being actively searched for by clicking on the “Shopzilla Top Searches” link in the footer of the Shopzilla.com website as shown below. From here, you can choose a product category and Shopzilla will tell you which items are being sought after the most! Editor’s Note: Are you enjoying this post so far? If you are interested in starting your own ecommerce business, then sign up for my FREE 6 day mini course below! Pinterest is a social media platform with hundreds of millions of active users and it’s a place where people go to find new ideas and products to improve their life. Did you know that 90% of people who are on Pinterest use the platform to make purchasing decisions? 90%! 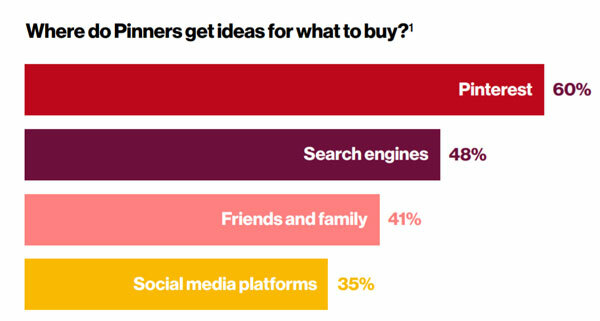 70% of people use Pinterest as a discovery engine for new products. Even though people find products to buy on Pinterest through keyword searches, the way people search on Pinterest is drastically different than on a typical search engine like Google. When people shop on Pinterest, they are not usually looking for a specific product. Instead, they are looking for solutions to their problems. For example, a typical Pinterest user would not look for a dresser for their child’s bedroom. Instead, they would look for “How To Decorate A Nursery” or “How To Decorate A Little Boy’s Bedroom”. As a result, when you brainstorm for products to sell using Pinterest, you want to perform bigger picture searches like “Wedding Gift Ideas” or “Unique Gift Ideas For Men”. What’s cool is that Pinterest gives you a guided search bar to help you refine your search ideas. With the guided search bar, you’ll find articles and products ideas directly from your Pinterest feed. And in general, the pins with the most repins will tend to contain popular products that you can sell! Once you’ve chosen a product or a set of products you want to sell, the next question you have to answer is where you will source your products from? How and where do you contact the manufacturer so you can get wholesale pricing? Before I tell you the best way to find your vendors, there are several things to consider right off the bat. Do you want to deal with only domestic (United States) vendors? Dealing with vendors in the US (or in your home country) is much easier because everything is familiar to you. It is much easier to contact your vendors because they are in a similar time zone and they speak the same language. However, because the manufacturing costs are much higher in the US, you will end up paying more money for your products which will negatively affect your profit margins. The main advantage is that shipping arrangements can be easily made and it’s generally easier to obtain the products you want to sell. Do you want the absolute lowest cost for your products? If you want the absolute best deal for your products, then you might want to consider looking in Asia to source your items. These days, you’ll find that most things are made and sourced from Asia. Why? It’s because they offer the best prices. However, it can be a major hassle to import items into your home country. If you do manage to get the process down however, the profit margins are unbeatable. If you want to learn more about sourcing your products from overseas, you may want to read the following articles. Dropshipping is a type of online store where you are only responsible for taking orders and handling customer service. Once an order is placed on your website, your vendor handles the shipping and delivery of product to the end customer. Dropshipping’s main advantage is that you don’t have to carry inventory, but you are still responsible for making sure that your customer is happy and satisfied with the purchase. As a result, you have to make sure that the vendors you choose are absolutely reliable. If you choose to drop ship, handling returns can be a major hassle. Even worse, you’ll sometimes have to deal with irate customers even though you were not at fault. Deciding to drop ship also limits your choice of vendors and your margins are significantly worse. If dropshipping is a business model that you would like to pursue, the best way to find dropship vendors is to use a service called WorldWide Brands. In a nutshell WorldWide Brands provides you with a list of pre-verified drop-ship wholesalers, light bulk wholesalers (orders under $500), high volume wholesalers, liquidation wholesalers and import wholesalers. And they have a strict screening process to make sure that you are dealing with legit companies. From experience, it can be difficult to locate wholesale vendors that are willing to dropship by doing random web searches. So why waste your time when there are many services out there that aggregate the data for you already? Keep in mind though, that services like Worldwide Brands won’t do the heavy lifting for you. You still have to take the time to contact each and every vendor and create your own business relationships. Finding good vendors and establishing trust is the key to good product sourcing. Now that you are aware of your product sourcing options, the best way to find vendors is to attend wholesale tradeshows. For example, if you are interested in importing products from China, you can check out the China Import And Export Fair Website. If you are interested in wholesale fairs in the US, you can check out various tradeshow websites such as Wholesale Central. They will have samples of their merchandise available for you to see. This is especially important when dealing with overseas vendors because obtaining samples can sometimes take months. Why Not Do All Of My Research Online? You might think that you can do all of your vendor research online, but wholesale vendors that you find on the web can be extremely sketchy. In fact, there are many vendors online that are middlemen who pretend to be wholesale vendors just to get your business. It is because of these deceptive practices that I recommend finding vendors at trade shows rather than purely online. For more information on buying wholesale, please checkout my article on Why Buying Wholesale Can Be Misleading. Of course, if you don’t have the means to go to trade shows, then you can also use a service like Alibaba to find Asian vendors online. Once you’ve decided on the products to sell online and you have your suppliers in place, it’s time to start selling online. Finding and sourcing products to sell does not have to be a haphazard experience. As I have demonstrated, there is a wealth of data out there that can help you narrow down what you want to sell online. And once you have a few products ideas in mind, you can then further narrow things down by performing a supply/demand and competitive analysis on your niche. If you find that you can make a good profit on your goods and you can do a better job than your competitors, then I say go for it! By the way, if you enjoyed this post and are looking for more tutorials, then sign up for my free 6 day mini course below. WOW Steve there is a TON of good information in this article. Thanks! Hi! I just started my business. I tried to apply at jean.com and groopdealz.com but i have been denied. What should I do to get approve? Any advise? You certainly have a wealth of information to share on sourcing products for online stores. Very useful indeed! Thanks! Three of my vendors are drop ship and I stay in close contact with them whenever I get an order in. I know what they are doing and when they are going to ship the packages. Drop shipping is easy in some ways but its not a total hands off transaction. I want to start an online Business. I am from Brazil and want to BUY some cheap things to sell it here. Please send me the contacts that you have to help me out with that progressing steps towards success. Great information! Definitely adding you to my Favorites. Thank you very much for these articles that you have written. They are very informative and have helped me decide whether or not I should get into the online market. I am curious to know if you have heard of the global supplier Alibaba? If so, any thoughts? I have read good and bad reviews. Yes. Alibaba is a place where you can find various vendors in Asia but you have to do your own legwork. Personally, I’ve found the interface to be somehwat cumbersome but I do know several of my friends who use the site to establish initial contact….Actually, I take that back. Just visited the site again and it’s been completely redesigned. Looks much easier to use now. In any case, Alibaba is definitely legit. Thanks for the kinds words and for stopping by! You have very good information in this article are given. For this we are eternally be grateful and heartfelt thanks to folding. – We make our store of Rediff Shopping in Blog, commission Basis means to sell stuff. How to contact sellers with products in India and Asia? Sanjeev.sehgal.hansi @ gmail.com my email address in detail the procedure to the trouble of telling. Thanks for the information. This seems helpful. I just signed up for a domain name, service, etc for various outdoor product lines – patio furniture, grills, patio heaters, birding products and I hope to expand into outdoor kitchen items – refrigerators, built in grills, etc. Do you have specific advice for someone who only wants to do this on the side and not full time and secondly, how do you address offering a link to related sites? Do you simply have a written agreement with those other entities for a certain percentage of sales? Also, I am a landscape architect and have a website started. Is it appropriate to have a link to that? If you want to do everything on the side with as little monetary risk as possible, I would pursue either dropshipping or being an affiliate. If you are going the affiliate route, you will need to seek out those companies that specifically offer an affiliate program. That way when you guide a customer to their website, the click is tracked and you get credit for the sale. If you go the dropshipping route, again you will need to form some sort of arrangement where you generate the sales, collect the money and they ship the product to the end customer. Not come across Clickbank before. I used to use Commission Junction once upon a time, but I am looking into finding a new network. I like the look for the gravity performance statistic, it appears to be a powerful tool. As the Web has expanded, and therefore the amount of affiliate publishers, you are without doubt right that it’s important to pick the right product, which I should think will be a niche product. Thansk for your imp tips. What do you recommend for people wanting to sell personalized items online? Hey Deloris. Could you be more specific? I’ am a beginner on E-commerce . I was trying to start doing it with drop shipper DOBA but quantity of products is very limited or out of stock. What could be a better way to start making business online? Thanks for giving us such precious advice! Dear Steve, i would be very thankful to you if you would list an items that are hard to find in US but, can be easily imported from India or other nations as well. I have no idea about which product I might be interested. But I found out that lot of tradeshows open for vendors only, so should i get a business license first in order to move forward? If so, how should I start? Thanks. Most tradeshows will not allow admission unless you have a business license. Getting a business license shouldn’t cost very much and should not be a big deal to obtain. This is useful for different countries. It’s great! Anyone out there looking for jobs ? We have Big opening for Jobs in Oil Rigs and Social Media Jobs. can it be done from home too? And not in US but from Estonia? HI,i just start a small jewelry business.you can see my facebook.com/stylishjewelryusa page. I want to sell on online.I tried on ebay but i sell only 2 items.Maybe i need help someone.Pleae give me a good advise. Thanks for your information. I worked on my product and creating my site, however Im stuck now. I don’t know how to market my product – I feel like google is running the online world and they make it almost impossible for newbies. How do I work to start getting some sales – or get my name out? Thank you very much for all the time and effort you put into this, it is most appreciated. Do you recommend using Big E Commerce or volusion or websites like them to use once you have a product to sell or do you know if they have products you can sell from them.Thank you Gilbert. I don’t know about the sites above but I use Adfora and its great and also simple to use. Please i live in Nigeria and looking for how to start buying and selling online. But am confused on the products to choose and websites to buy from. Your contributions are welcomed. It gets the attention. I find best luck staying away from top trending products just to help keep my cost down and you can really find some good gems. I don’t mind working hard, if I have logical directions, especially, don’t even mind since there is no apparent motive for you or your company to prosper from this information you are providing, (thank-you), this is admirable. Anyway, I hope this will help me. Plus, thank you for providing your time for others like myself. God Bless You, or whatever you believe !!! Build or host your website access my account, get website host. Online storage and auction membership. You can ask me anything regarding the Korea market. I am developing my own web site for selling product online. How can I get Korean Product to sell via my own web site. Look forward to hearing positive response at the earliest convenience. are you also interested of trade-in of products coming from us? we are store owners of SILVERSTONE Jewelry & Souvenirs, Philippine base. we have silver products, also wooden products, like wood carved and artistic designs. may i ask, what particular products you have in your storage? so that for me to consider my market. I would like to discuss what you are selling from Philippines. I am a U.S. based ebay seller who is just now starting over again on ebay. I am a small, one person operation. And am presently researching to find items that will sell well on ebay, amazon, and maybe even in an online store in the future. I am interested in what products you have to offer from Korea and how you can be of assistance to my business. Do you have a website? Or do you have a Catalog? Or is it possible that you can be utilized as a dropshipper for my ebay store with no minimum order requirements?? Just let me know how I can view your Korean product inventory and pricing please. Also looking for additional dropshippers and suppliers with prices low enough to create a good profit margin. We need the merchant account (the payment gateway). how we can get it- as we tried with authorized.net, but didnt get the merchant with them, and most other are asking for the previous bank statement, but as we have started our business in last month, so how can we do that. please guide us to get the merchant account (virtuel terminal). Finding vendors online is never easy but this is very helpful article. This is a very informative article to improving business.Thanks for sharing it. Thank you for writing this article, very helpful. Why when using LTP do you want your searches to be limited to 3000? Does anything less than this mean that there is not enough demand for your niche products? I was following you up to the part where you said find a good drop shipper and then lost you when you said THEN all I have to do is find good vendors? I’m confused I thought the drop shipper is the vendor and the shipper too?? I’m keen to understand how I can set up a shop with no capital/inventory. Thanks so much! It’s in the name, Drop “shipper”, a drop shipper ships product from “vendors” to your customers for you. Hence the phrase middle man and higher cost. Without great credit and/or finances, i.e. established getting a merchant account and quality vendors is the impossible. Thus “Drop Shippers” to the rescue. Your BS must sell the products because your prices certainly will not. You could offer longer, higher, better guarantee/warrantee rates to explain your high prices which will most likely kill profits and your business. 99% work, 1% luck in building a profitable name. This is a very informative article for business improvement. I was thinking to start with some 3d printed toys because they are cheap an not so fragile. I completely agree with the idea of visiting the trade shows where the wholesalers set their shop. It is one of the easier and effective ways of getting access to some great vendors. Very informative post indeed. These are great tools you’ve enlisted! And I like the way you’ve made this article a step by step tutorial for keyword research. As for competitors analysis I’d rather stick with tools like SERPstat – way cheper and deeper than any tool here. nice tips and articl, thanks you, im Hendrik from Indonesia, please your visited my website ! Where in hell did you get to? We were conversing a couple of years back when my old PC (Dell) crashed and burned. Before I could get set up with a new machine and back online I had to ship out on a 12 month project to the Canadian arctic running a mining camp build – when I got back I couldn’t find any sign of you. Finally today I came across your site again by chance and I’m posting the link to my email account so you can never hide from me again. Glad I found you again and I’m looking forward to learning all you have to teach me. Thank you sir for this wealth of information. I am an ebay seller who is just now starting out again on ebay. My biggest problem has always been finding the right products to sell, and while so far.. I mostly dropship, the right suppliers/dropshippers. I will begin using your teckiques emmediately to help me find good selling products and then.. some good suppliers/dropshippers. I thank you much for your website and your efforts my friend. It’s a good tip to sell products between $15-200, I wouldn’t have considered that to be that important before. Starting an online business can be a great way to make money, but it’s important to do your research beforehand to be sure that you’re ready for that commitment. It’s can be beneficial to seek out resources to know how you can make the most out of your business. Nice and informative article. Thanks for sharing the information with us. I run an online shop and this article was a great help to me. Great article. You need to do your research. I’ve listed lots of products in the past only to have them sit and not sell. Its easy to start an online business, where it gets difficult is making it profitable. Very useful information. You share interesting solutions. Very good and helpful info. Thanks for sharing. Thanks for the article, much need article for me right now, I gained a complete knowledge here, I am looking forward to learning more, keep doing this great work and keep sharing with us.